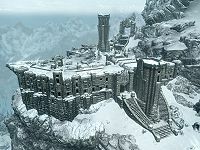 High Hrothgar is a small settlement roughly halfway up the Throat of the World, and east of Whiterun. It is a major landmark and home to the reclusive Greybeards who are masters of The Voice. Traveling to High Hrothgar requires taking the 7,000 steps, beginning in Ivarstead. On the way up to High Hrothgar there will be at least one frost troll on the path regardless of your level (though you can avoid fighting it), and you will potentially encounter several more cold-themed enemies like snow bears and ice wraiths. As well as enemy encounters, a few travelers will be seen on the way to the top - pilgrims that are exploring and reading the ancient tablets, which contain wise sayings. Reading all of the tablets grants the Voice of the Sky effect for 24 hours, which prevents animals from either attacking or fleeing from you, and they do not have to be read in numerical order. The Way of the Voice: Meet the Greybeards. The Horn of Jurgen Windcaller: Retrieve a Greybeard artifact from Ustengrav. The Throat of the World: Receive a lesson from Paarthurnax. Season Unending: Enforce a ceasefire to secure Dragonsreach. Paarthurnax: Deal with a potential threat. Climb the Steps: Deliver a load of goods up to High Hrothgar for Klimmek. Once you have completed The Horn of Jurgen Windcaller you can safely take any items from within High Hrothgar. If you later on kill Paarthurnax during the quest Paarthurnax, then taking items here will be counted as stealing. Potions: Draught of Strength, Frostbite Venom (x2), Potion of Haggling, Potion of Health (x3), Potion of Regeneration (x5). Ingredients: Bear Claws, Bleeding Crown, Blue Mountain Flower, Chicken's Egg, Deathbell (x4), Dragon's Tongue (x5), Frost Mirriam, Glow Dust, Hanging Moss (x3), Imp Stool, Lavender (x6), Orange Dartwing (x2), Purple Mountain Flower, Red Mountain Flower, Sabre Cat Tooth, Slaughterfish Scales (x2), Snowberries (x3), Tundra Cotton (x3), Void Salts, Wheat. Books: A Children's Anuad, A Dream of Sovngarde, Aedra and Daedra, Dwemer Inquiries Vol I, Dwemer Inquiries Vol II, Dwemer Inquiries Vol III, Frontier, Conquest, Gods and Worship, Life of Uriel Septim VII (x2), Remanada, Ruins of Kemel-Ze, Song of the Askelde Men, Songs of the Return, Vol 19, Songs of the Return, Vol 2, Songs of the Return, Vol 56 (x2), Songs of the Return, Vol 7, Spirit of Nirn, The Alduin/Akatosh Dichotomy (x2), The Dragon Break, The Dragon War, The Great War, The Hope of the Redoran, The Monomyth, The Oblivion Crisis, The Rise and Fall of the Blades, The Song of Pelinal, v3, The Song of Pelinal, v4, The Song of Pelinal, v5, The Song of Pelinal, v6, The Song of Pelinal, v7, The Wispmother, Yngol and the Sea-Ghosts. At the center of a pair of stairwells that lead up to the building itself, there is a blue chest, three large sacks, and a sack around it which are set as non-respawning containers, and can thus be used for safe storage. It seems that early in Skyrim's development, you would have been able to enter High Hrothgar freely before Dragon Rising was completed as Arngeir has unique dialogue should he be spoken to before that quest is finished. It is still possible to enter High Hrothgar early by entering through the back doors, by climbing the mountain around it (using a horse). The compass directions inside High Hrothgar is turned 90 degrees counter clockwise compared to outside. The gate near the mountainous edge of the back courtyard of High Hrothgar has very odd collision issues. While it is opening, certain parts of its left door will lose its hitbox and go right through you. This will also cause its hitbox to distort and move to the south a short distance, which will persist even when the gate is closed. ? It isn't possible to interact with the gate from the distorted hitbox, as you can only close it from where the model is. These collision bugs don't occur with the right side of the gate. This page was last modified on 7 January 2019, at 04:24.